Can you just feel the excitement? Surely it’s not just me. At our house, the tree is up and our stockings are hung. I’ve already made an unnecessary amount of Christmas cookies and my kitchen smells like a cinnamon stick/ fir tree hybrid. My Christmas socks are back in rotation, and I’m about one Mariah Carey song away from my husband refusing to ride in the car with me anymore. Surely this holiday cheer isn’t reserved just for me- IT’S THE MOST WONDERFUL TIME OF THE YEAR! 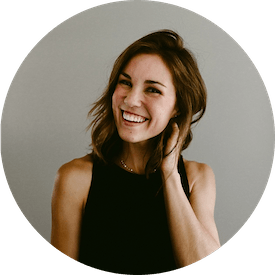 This time of year always elicits a number of merry memories and feels for me, and as I grow older, I find myself trying to cultivate that same wonder and excitement for my own family. I want my babies to grow up on the sounds and smells and sights that make this time of year so rich. Fires crackling in the fireplace. Christmas lights glowing on street lamps at night. Cookies and milk and Nat King Cole. Candlelight services and that babe in a manger and the jittery excitement that makes sleep impossible on Christmas Eve. This time of year is filled with so many opportunities to love people and make memories, and it’s just one of the million things I can’t wait to share with my children as they grow up. Growing up, there were always a few Christmas staples that I looked forward to every December, including Williams-Sonoma Peppermint Bark. I can close my eyes and distinctly remember those trips to the mall to pick up a tin or two to take home and pick at for the next few weeks days. To this day, it’s the go-to gift for my grandfathers each year and it’s a favorite to share as hostess gifts at holiday parties. Williams-Sonoma Peppermint Bark is iconic, unmatched in quality and taste, and it’s one of those Christmas favorites that I know my kids will grow up on as well. 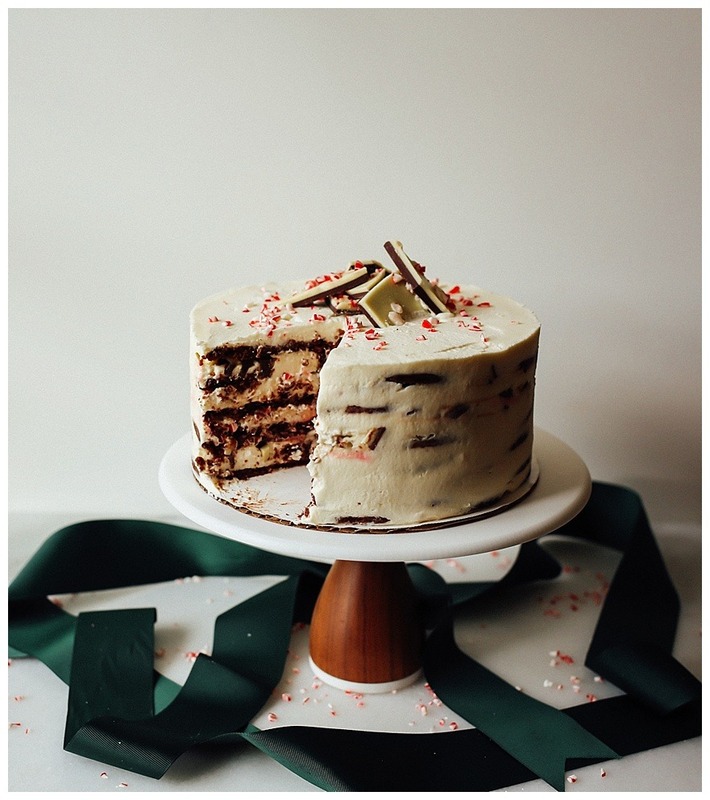 This is a peppermint bark icebox cake. Made with layers of hot cocoa cookies, peppermint and mascarpone whipped cream, and little crumbles of peppermint bark, this icebox cake is a dessert that will make all your days merry and bright. The lightly sweetened cream is rich in flavor and delicate in texture, making it a perfect match for the thin and crispy cocoa cookies. I used hot cocoa mix to produce the wafer thin cookies, and their chocolaty, slightly salty flavor is just to die for in this cake. 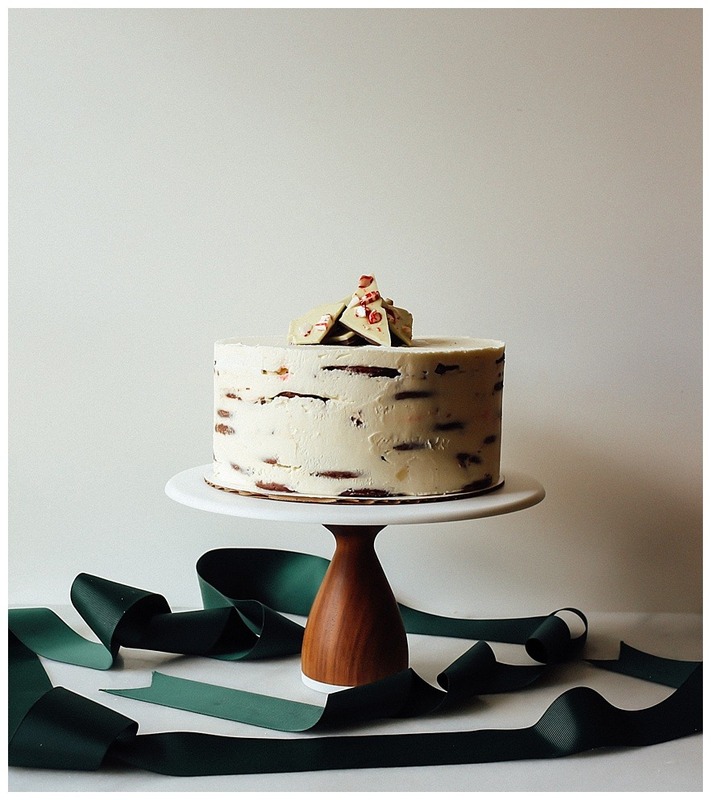 The star of the show is the peppermint bark, which adds a creamy crunch to every bite and makes this a visually stunning and festive cake. The cookies for this peppermint bark icebox cake can be made and stored in the freezer up to a couple of weeks in advance. In a pinch, you can substitute store bought chocolate wafers, but don’t underestimate the sweet and salty goodness you’ll miss out on with the homemade version. 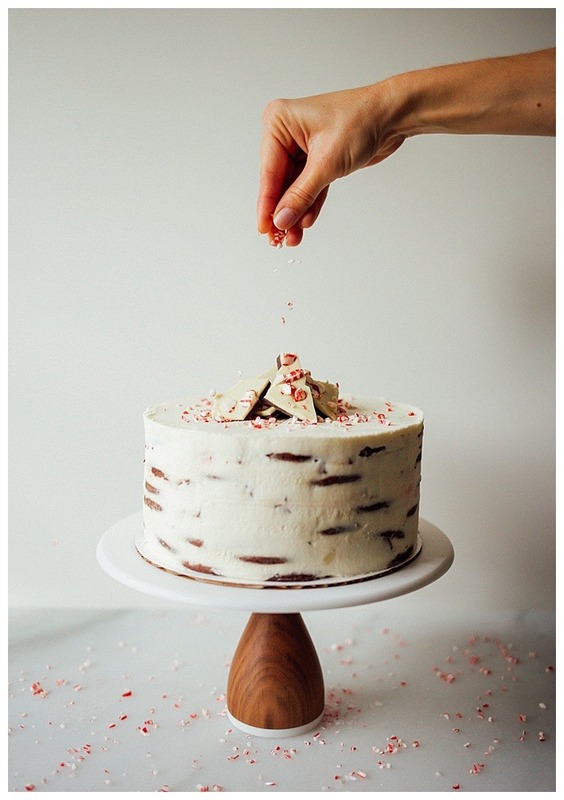 The cream, which takes only a few minutes to whip together, helps to soften the cookies as it refrigerates over night, so that when you’re finally ready to slice into the cake, the layers are creamy and cake-like, punctuated by the crunchy bits of peppermint bark. I wouldn’t change a thing in the world about this recipe, unless I could insert a mandatory cup of coffee and background music of the “Christmas Vacation” theme song. 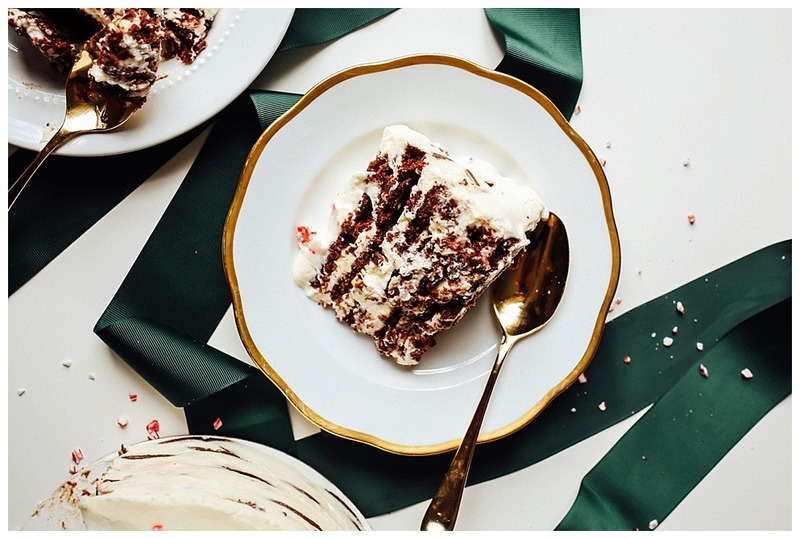 This peppermint bark icebox cake is a delicious reminder of why this is the most wonderful time of the year, and I know you won’t regret making it. Give it a try and let me know what you think! 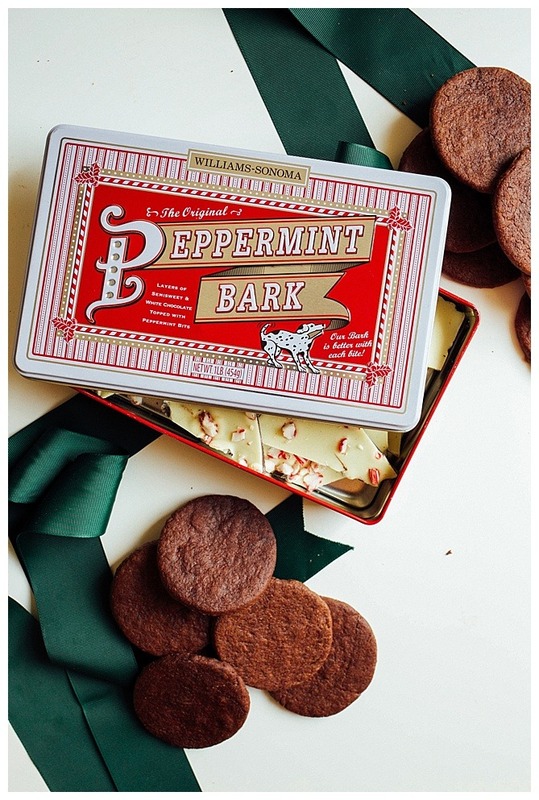 Oh, and P.S., when you go pick up your peppermint bark, do yourself a favor and buy and extra tin… or four. Whatever. Do what you gotta do. All of my gratitude, hugs, high fives, and holiday blessings to Williams-Sonoma and my friends at Feedfeed for inviting me to be apart of the #barkyeah campaign. It’s an honor to promote a product that has played such a delicious role in my Christmas traditions and I’m thrilled to share it with everyone! 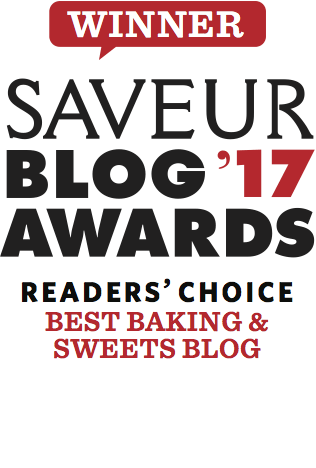 *This post is sponsored by Williams-Sonoma and Feedfeed, but as always, all opinions are my own. 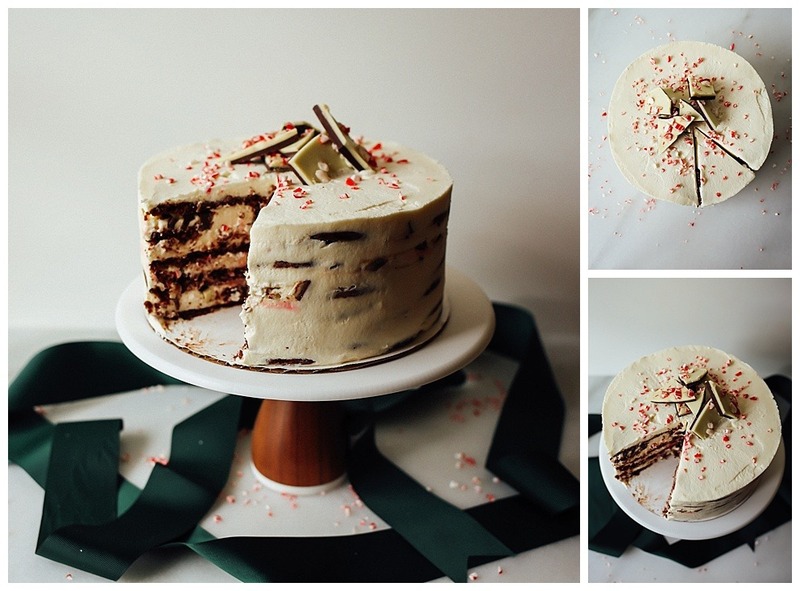 This peppermint bark icebox cake features layers of hot chocolate wafer cookies and peppermint mascarpone cream, and is sprinkled with small bits of Williams-Sonoma peppermint bark. 1/2 pound of peppermint bark, finely chopped. Beat together the butter and sugar until well combined, about 1 minute. Add the egg and vanilla and beat again until thoroughly combined. Scrape the sides of the bowl and add the flour, hot cocoa mix, salt, and baking powder. Stir on low until well combined. On a clean surface, pat the dough out into a flat, round disk. Allow to chill in the fridge until firm, about 30 minutes. When ready to bake the cookies, preheat the oven to 350 degrees and line a cookie sheet with parchment paper. On a clean surface with a heavy dusting of cocoa powder, roll out the dough until 1/8” thick. If the dough feels too sticky, allow to chill a bit more in the fridge or add more cocoa powder to your surface or rolling pin. Cut 2-1/2″ round cookies out of the dough with a biscuit or cookie cutter. Place 1-1/2″ apart on the cookie sheet and bake in the oven about 10 minutes. Allow to cool to room temperature prior to using in the icebox cake. Add the mascarpone cheese, cream, sugar, and extract to the bowl of a stand mixer. Beat on low for a minute to combine and then slowly increase the speed, whipping just until stiff peaks form. Prepare an 9″ springform pan by spreading 3 tablespoons of cream on the bottom of the pan. To begin forming your cake, arrange one layer of cookies over top of the cream, breaking the cookies as needed to fill in large gaps. Spread 1/5 of the cream (a heaping 3/4 cup the mixture) evenly over top of the cookies. 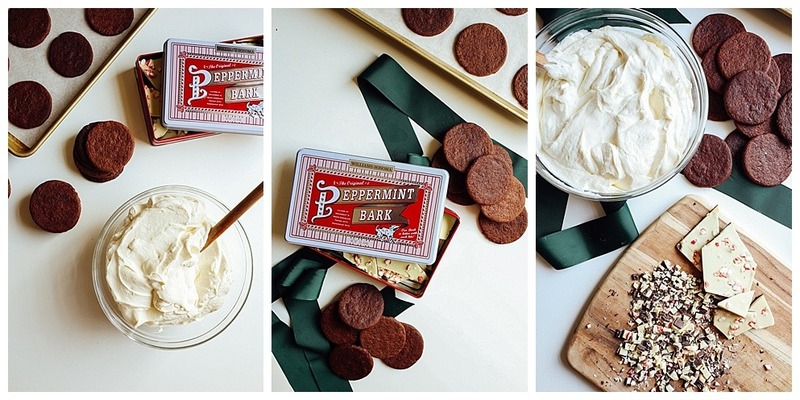 Sprinkle a small handful (approximately 1/5) of the peppermint bark over top of the cream. Repeat this process 3 more times, stacking layers of cookie, cream, and bark. Add one final layer of cookies and the remaining cream to the top of the cake, smoothing out the top until flat and even. Cover with plastic wrap and refrigerate overnight, or at least 12 hours, to allow the cookies to soften and the flavors to blend together. When ready to eat, decorate with any remaining peppermint bark, or even Williams-Sonoma Peppermint Snow. Slice and serve chilled. For a taller cake, use a smaller (7″-8″) springform pan, lining the sides with a tall sheet of acetate which will serve as extended sides to the pan. You’ll end up making about 6 layers of cake using this method. In a pinch, store bought chocolate wafers can be used instead of the cookies. You’ll need approximately 18 ounces of wafers. I love how you frosted this cake! Beautiful! This is so wonderful and beautifully written. Thanks for inspiring me! I miss the old Mariah. The curly haired, santa-outift-wearing mariah. Let’s get more of that. And more cake. Always. i’m not feeling very christmas-y, but i’m sure it will kick in next friday (aka when i’m done with finals!!). 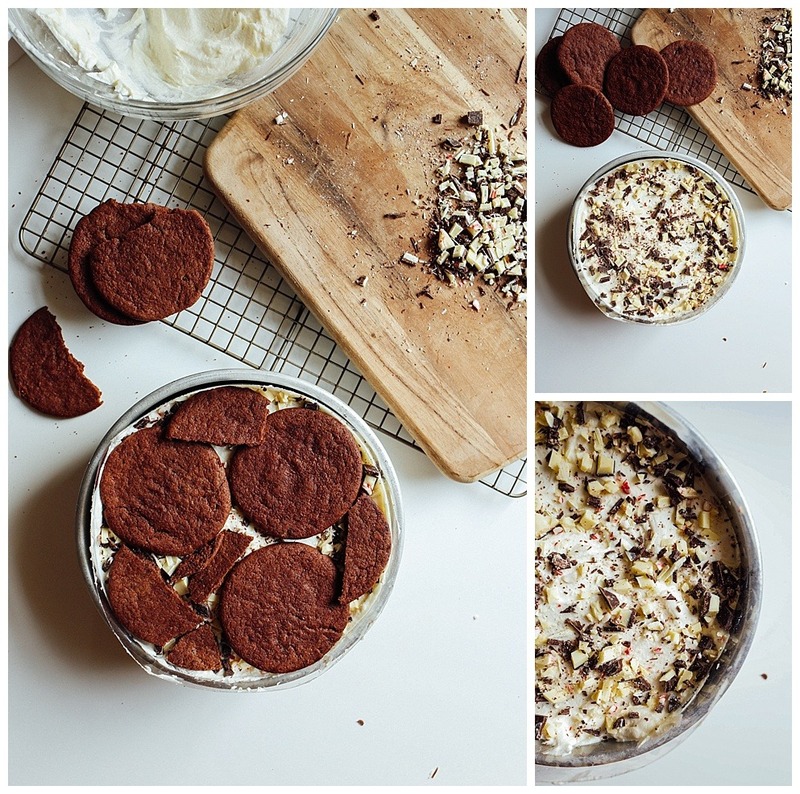 somehow i’ve never made an icebox cake (ack i need to get on that! 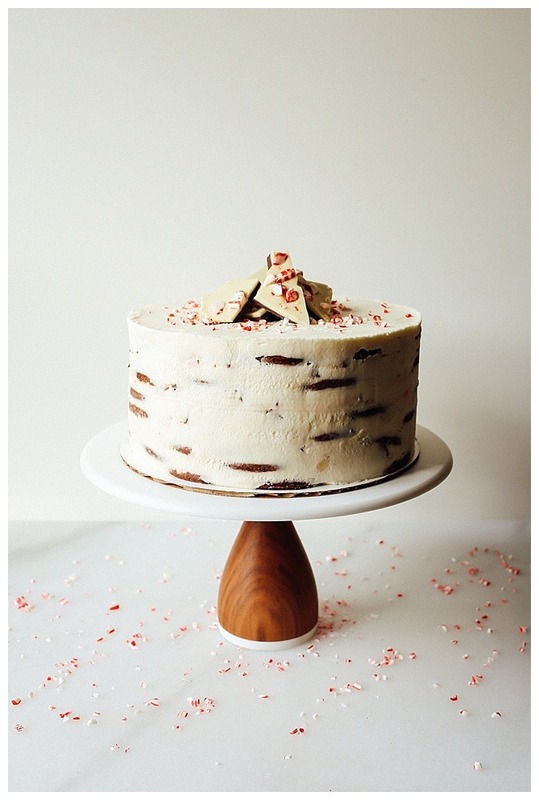 ), plus peppermint bark is delicious in everything, so this might have to be on my holiday bake list! also, can completely relate to your ina and taylor fantasy.